Even though it was cold, we did just fine. On Saturday, with temperatures “warmed up” to -10, we drove down to Bill and Kelly’s house to help celebrate granddaughter, Ava’s seventh birthday. The sun was out and the roads were clear and dry so the drive was uneventful. We had a blast; her birthday theme was unicorns so all the little girls wore gold unicorn headbands with ears. Too cute! 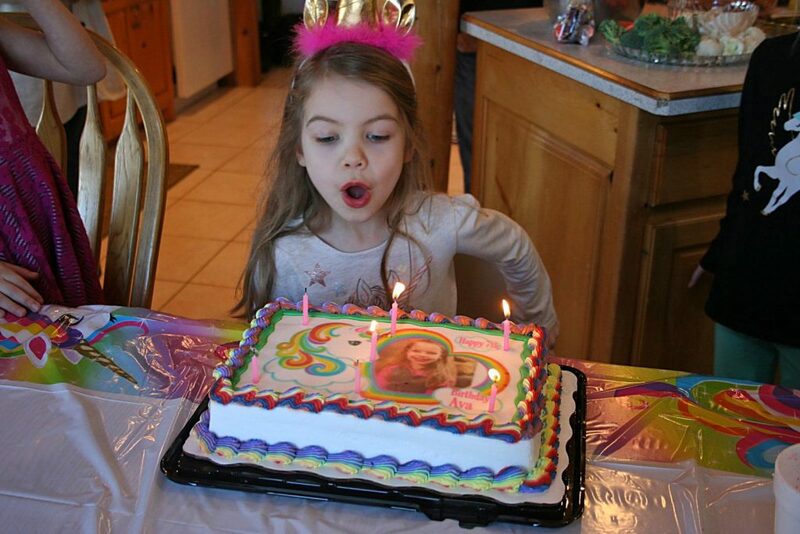 Ava blew out all of her candles! Mason playing Happy Birthday for Ava. 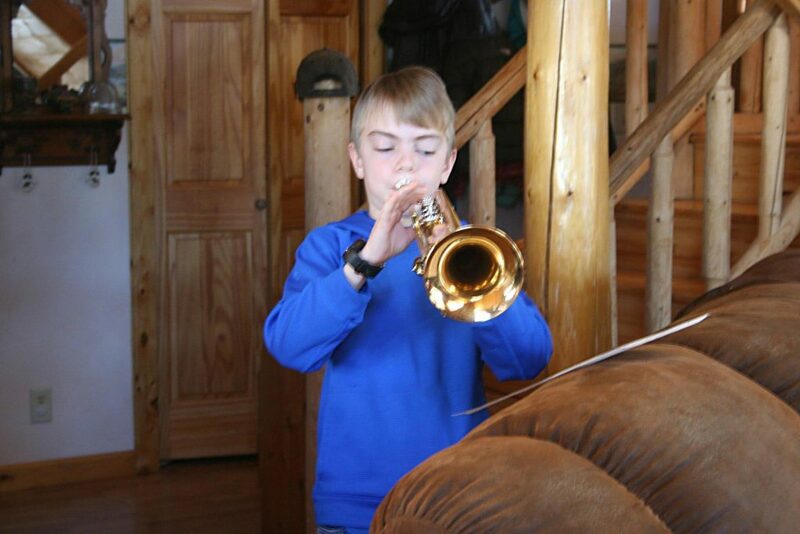 When it was time to sing Happy Birthday, our grandson, Mason, came out of his room with his horn and played Happy Birthday as we sang. Wow, that was neat! We partied and ate great food as usual, but we had to leave early as our wood stove doesn’t hold a good fire for more than six hours and the temperatures were falling steadily. On arriving home, we dashed around doing chores at -20 and when we got in, I cleared off and started our kitchen range. That really helps keep the house warm when temperatures fall really low. In short order, Will had the living room stove going nicely and the wood range was throwing off nice heat so I opened the oven door and we enjoyed the heat while the temperatures fell outdoors. When it gets that cold, I stay up late and Will gets up early and we both stuff wood in the stoves when we get up in the night to go to the bathroom. (Hey, when you get older, you don’t need to set alarms to get up to put wood in the stove; your bladder does that!) In the morning, Will stacked the leftover firewood in the wood box and put on his barn clothes to get more wood. 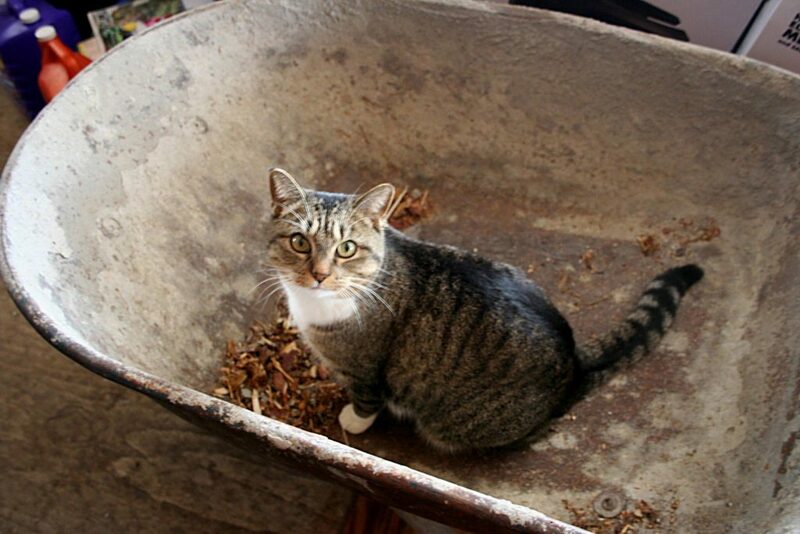 As usual, Mittens hopped in the wheelbarrow to get her ride. She loves to ride in the empty wheelbarrow! We have strange animals. Mittens waiting for Will to take her on her morning ride. On Sunday evening, we were getting ready to view what newscasters called the Super Wolf Blood Moon which was a huge full moon that would, later on in the evening, take part in a full eclipse. Luckily, the sky was clear although the temperatures were still below zero. The Super Wolf Blood Moon rising. I can’t imagine that cold! I love the automatic getting up in the night routine because that is me totally! Old age affects all of us! Cold here is -10 Celsius and that is rare. You folks are so well prepared! What an example you are for all of us! Robyn, It seems no matter how well prepared, something else always sneaks in. But we keep working forward to see what we can do. Thank you! Saw your weather today, thinking WARM thoughts that ya’ll are cozy on the homestead! Well, it’s been cold and going to get much colder by the forecast. Brrr I guess those beavers were right in their prediction of a cold, snowy winter! We’ll throw another log on the fire. Jackie, I love your comments on the goings on with your family! It made me feel like I was there!! Thank you Janice! We love sharing our lives with you all. So glad you were able to spend time celebrating with the grandkids. Those always make for special times and memories. We missed the moon for it was very overcast here in Missouri. -40…cold is cold is cold! Thankfully, we have not seen those kind of temps. here. You certainly are a hardy bunch to be able to do all that you do in those kind of temps. Kudos to you all. 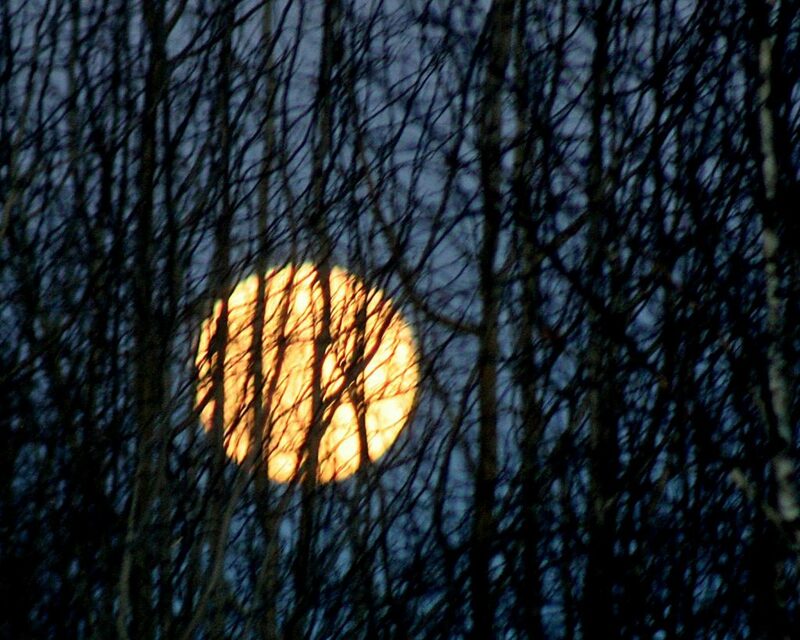 I’m sorry you missed the moon; it was simply gorgeous! We aren’t so hardy; we just dress warm and spend as little time in the sub zero weather as we need to. Hopefully it will warm up next week. We saw -30 and that was cold enough! Enjoyed the moon here also but could have done without the family running in and out to see the changes. It seems to me that below -20 is the cut-of between just cold and really cold. Oops. I was the one running in and out to see the moon. I couldn’t see it from in the house!